Did you know that there is a significant percentage of patients in emergency rooms who relate their issues to power tools? Also, hand tools can be very dangerous if mishandled just a little bit and you may end up joining the myriads of patients in the emergency rooms. Most of the emergency room visits are related to mishandling of power tools or working with them when they are not functioning properly. Now, power tools have become an integral part of our daily lives that we no longer seem to care much about the hazards these things can pose. After sourcing a reliable piece of information from power tool experts, we hereby provide an informative article regarding the best use of power tools. And indeed with proper measures, we can cut down the number of emergency room visits related to power tools. We will start by analyzing what these issues are and ultimately we going to list the measures you can put across to avert the related hazards. Think of it this way; you are hurrying to meet the deadlines, and you no longer seem interested in caring about the safe use of the machine. It has been proven statistically that the major causes of accidents when working with power tools is doing things in a hurry. When you overload your workers with work, they will definitely do it in a hurry to catch up with the deadlines. This can cause accidents and very serious ones. Besides, no matter how confident the operator is he or she shouldn’t rush to meet the deadlines. It is better to be slow rather than rushing to meet the deadlines only to lose or damage your body parts. The best thing to remember is that ‘you should never be complacent. As you know, most power tools operate at remarkably high speeds, Right? Now, things happen suddenly, and you may not know that there is appending danger. You only realize it when it has already happened. Now, unexpected events can be very dangerous to beginners because they usually lack the know-how of how a particular tool operates. This is yet another typical cause of injuries when working with power tools. As studies have shown, issues related to novices are often caused by lack of enough knowledge. This happens because the newbie may not actually know when the potentially dangerous situations and how to dismiss them early. However, the experienced operator can also be caught up in a very bad experience too. If your hull into overconfidence, you can actually ignore some important safety measures and end up in the same situation as the inexperienced operator. Training your workforce first is the best way to avert these accidents related to power tools. 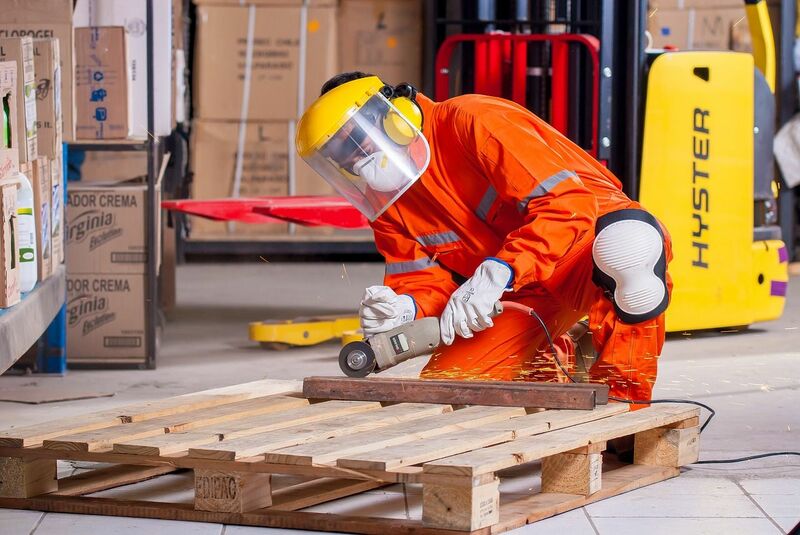 You need to impart proper training to your workforce regarding the best way to use power tools and how to deal with dangers when they happen unexpectedly. However, you also need to understand that ‘error is to human’ and also human seem to forget so fast. So, you need to occasionally retrain your employees on the best use of power tools. Giving your employees refreshers on potential hazards and safety practice has proven to be the best way to reduce what we said earlier ‘emergency room visits. We have different kinds of power tools on the market, and each has its own uniqueness. But, the fact remains that they all use electricity as the source of power. That’s why we are going to look at the general safety tips for power tools. Hand tools such as cutters and hammers need to be made of high-quality metal. The material should be heat treated, and it should be steel. This is the best material since it has invincible properties. It is incredibly heated tolerant, doesn’t go out of shape and is very durable. Power tools such as drills are very sensitive to this aspect. The drill bits need to be totally invincible since you will probably be working on pretty hard materials. It is recommended that you inspect every tool before use probably on a daily basis. By doing so, you ensure they are in good shape and perfect for use. A little defect can mean a lot, and if you assume it, you may end up in the intense care unit. For the cutting tools, you need to perform regular sharpener and grinding. However, you need to precisely follow the manufacturer’s instructions since different tools may vary in terms of maintenance practices. Taking for instance the table saw which is commonly used in all woodworking; you should never wear wobbly clothing and jewelry. Many people ask why this restriction is so much important. Imagine if your jewelry gets hooked in wood being pulled by the blade. Well, it is obvious that your hand too will end up in the machine. Your eye, hands, nose and other body parts need to be protected when working with any power tool. Wearing personal protective clothing keeps you in good health. You need equipment such as gloves, goggles, helmets, and others. However, they are instances whereby gloves should not be worn such as when working with table saws. As stated earlier, gloves can get hooked up in the rotating blade and before you know it your hand too will be ground within seconds. So, that’s why we said it is very important to understand the machine you are working with and learn the recommended measures. You may actually wonder why it is recommended to work on a clean and clear surface such as when working with woodworking tools. Do you just step on a pile of sawdust and think you are safe. Well, your legs need to be firm on the ground to ensure you don’t accidentally slip over the moving blade and you will just become history. Always look around you and make sure everyone stays clear of your tools. You should actually not let anyone new to the tools be any closer to your site. If they have to visit your job site, ensure you have switched everything off. Equally, you must not let anyone get near the main switch. This will keep kids and anyone unfamiliar with the tools safe all the time. Carrying a power tool by hand when climbing up a ladder can be very dangerous. You can easily slip off, and the tools could hurt you badly. Instead, you’re supposed to a bucket or similar item to hoist the tools from ground to the worker to ensure everyone remains safe. Okay, this tip is similar to the aforementioned but still makes lots of sense. So, when working on heights, you need to ensure that you don’t leave the tools lying out in the areas they can pose any danger to the workers below. Indeed, most of the power tool related accidents have been reported to happen when things are left up and ends up falling injuring the workers below. Now, most of the power tools are clamped on the working table. You should, therefore, ensure that the tools are secured safely. When you secure your work well, you can increase the effectiveness of what you’re doing at the same time reducing the chances of injuries. Once you secure them with a vise or clamp, you reduce the chances of them slipping off. Sharp pointed tools are the most dangerous to work with. They can easily drill holes in your pockets and reach your tender skin and do the same. Instead, you need to carry these tools in the cart, or the toolbox. If you carry a power tool by its cord, it can cause accidents. Just imagine if a high wattage tool has got a cord with a slight uncovering may be due to insulation damage. If you just touch the bare wire, you get seriously electrocuted. Similarly, ensure you use three-pronged cable and a grounded receptacle to increase your Safety. Using a ground fault circuit interpreter keeps you safe from all-electric malfunctions. All the same, you need to avoid wet working environments unless the tool is certified for that. Whether old or new, tools can develop various defects. It is upon the worker to inspect the tools every day or every time you use the tool. Remember, the person using the tool is the one in the highest probability of getting hurt when the tool misbehaves. The point is that you need to frequently check the tools before use and report any damage, fault you see in it. Use the right cases for storing your tools at work. Keep them safe out of reach of inexperienced persons or kids. Equally, you need to carry extra tools to act as a backup plan just in case some of your power tools misbehave. It doesn’t matter whether you’re a professional or a newbie user for power tools. But, instructions for these devices are made for everyone. If you try to take a shortcut by avoiding these guidelines, it may spell a disaster. In fact, most of them are self-explanatory, yet some people just choose to avoid them and do their things. But, we have aligned the instructions well, and everyone needs to understand them well. After all, power tools are inevitable, but you can minimize the accidents related to them very easily.